PennSurf2 is a powerful way to explore the phase diagram space of (especially) oil recovery systems. It includes the effects of pressure which are miniscule for ordinary systems but important for oil wells where pressures of 100s of Atm are common. Obviously, this is an expert-level app for those with a deep interest. 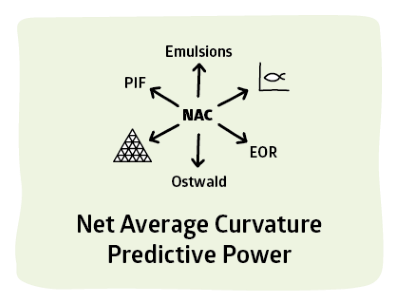 Because this app is not intended as a serious oil exploration tool, it lacks some specific features of the PennSurf2 tool which first fits experimental data (often at super-high pressures) to obtain specific parameters which can then give accurate estimates of behaviour away from the fitted region. This still leaves us with plenty of input parameters as the temperature and EACN coefficients in the HLD equation are now tunable and the all-important ξ parameter is estimated via a set of constants. 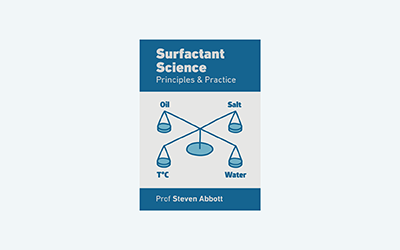 Surf Mag sets the magnification of the plot in the direction of the Surfactant. When using efficient surfactants you need a high magnification to see the details of the phase diagram. The other inputs are described below. The outputs should be self-explanatory. The assumption is that at some set of Reference T, P, EACN, S values you have HLD=0 for an ionic surfactant. [Non-ionics could be included but are less used in EOR and would complicate the interface further.] This is a necessary starting point for all explorations of the phase diagram. You can now alter your actual T, P, EACN and S and see how things change. You have a set of coefficients for the dependency of HLD on that parameter. For T the standard assumption is a coefficient of 0.1, for EACN it is 0.17 and for P it is "small" though given pressures of several 100 atm down a well, the actual effect can be large - especially if amplified by the dissolution of gases like methane which lower the EACN. For S the usual log behaviour is assumed. The key complication, as described elsewhere, is ξ, the coherence length. This varies enormously across the formulation range. In this app it is described by 6 parameters. The first three, I, H1 and H2 change the shape of the lobes of the phase diagram, the β values describe how ξ depends on parameters with 1/ξ = β3 + β2P + β1 (T/25 + S). The T/25 is to scale the T effect to the S effect using the single β1 coefficient. Clearly for real formulations such parameters are found experimentally, as described in the papers. Note, that as ξ increases (try decreasing β3) the multi-phase region shrinks because the surfactant is a more effective solubilizer. The dotted black lines at the edges of the curves are the critical tie lines as explained in the original paper.